Magicard CK1 Cleaning Kit. 5-Tcards and 1 pen. It is recommended by the manufacturer to clean the printer every time you replace the printing ribbon. If you have a dirty or dusty environment you may need to clean more frequently. 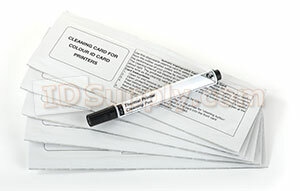 Magicard cleaning kits are especially designed for Magicard printers. Genuine Magicard cleaning kits promote hassle free printing and an extended lifespan of your printer.